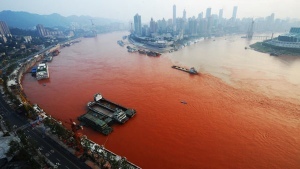 Chinese River turns from “golden” to Red! For a river known as the “golden watercourse,” red is a strange color to see. Yet that’s the shade turning up in the Yangtze River and officials have no idea why. The red began appearing in the Yangtze, the longest and largest river in China and the third longest river in the world, yesterday near the city of Chongquing, where the Yangtze connects to the Jialin River. The Yangtze, called “golden” because of the heavy rainfall it receives year-round, runs through Chongqing, Southwest China’s largest industrial and commercial center, also known as the “mountain city” because of the hills and peaks upon which its many buildings and factories stand. I think I will ask Pat Robertson why this river has turned red. He always has an explanation. Maybe somebody made another pact with the devil. It is a communist country after all. Will North Korean rivers be next then?